Earn $7.12 in Rewards credit (712 points) What's This? Be prepared for winter riding. When it comes to successful, productive, and enjoyable riding in the winter months, the key to success is effective layering. While you may be tempted to throw on your aero shoe covers for that 30-mile off-season ride just to "take the chill off", you'd quickly find that hinders, rather than helps, your riding. With Assos' thermoBootie.Uno_s7, your feet will be covered in windproof, heat-retaining protection specifically designed for winter riding. 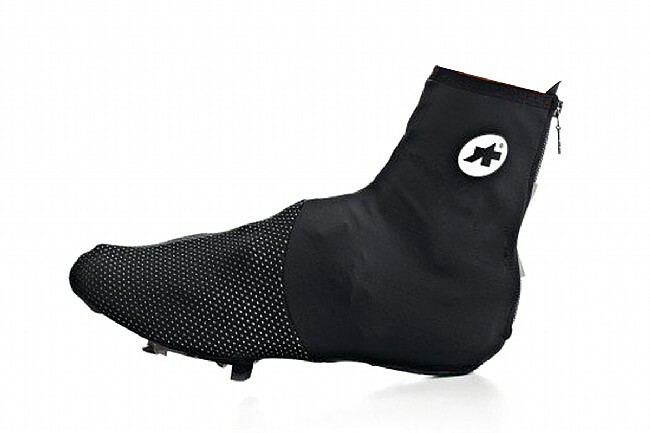 With Assos' superior design, the thermoBootie offers a glove-like fit that covers all possible entry points for maximum coverage. The overlapping design and rear-facing zipper closure work together to keep out drafts, while the lightweight insulation helps retain warmth for riding down close to freezing. The Assos thermoBootie.Uno_s7 is available in Black Volkanga in three sizes: O – 35 - 38, I – 39 - 42, II – 43 - 46.